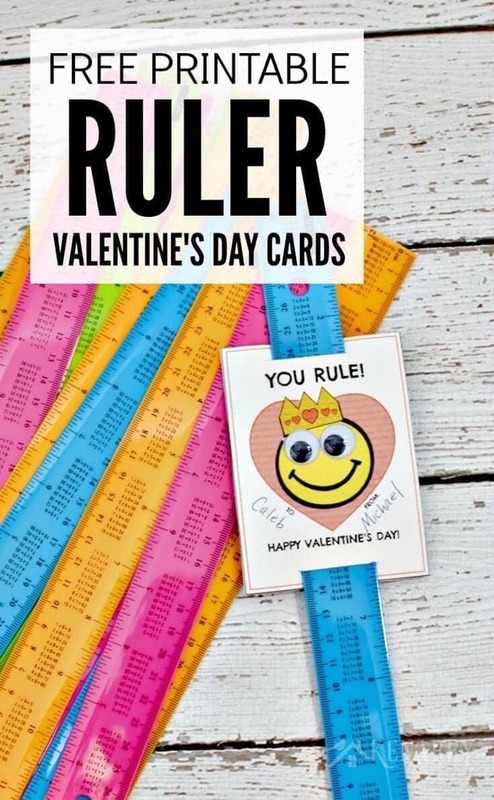 Your kids will love these Ruler Valentines with a happy face emoticon and googly eyes. 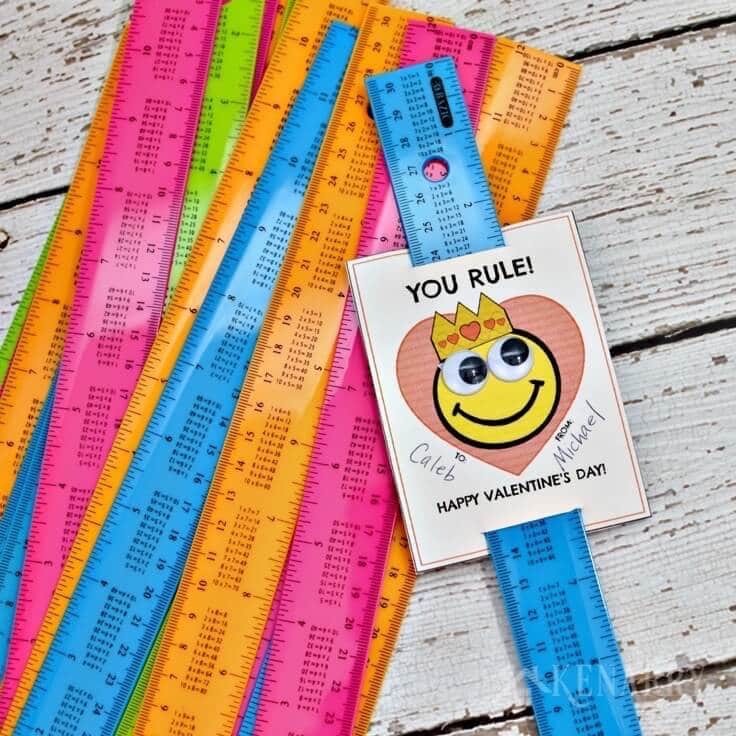 Free printable Valentine’s Day cards attach to rulers as a treat. Need a unique Valentine’s Day card idea for your child’s classmates this year? 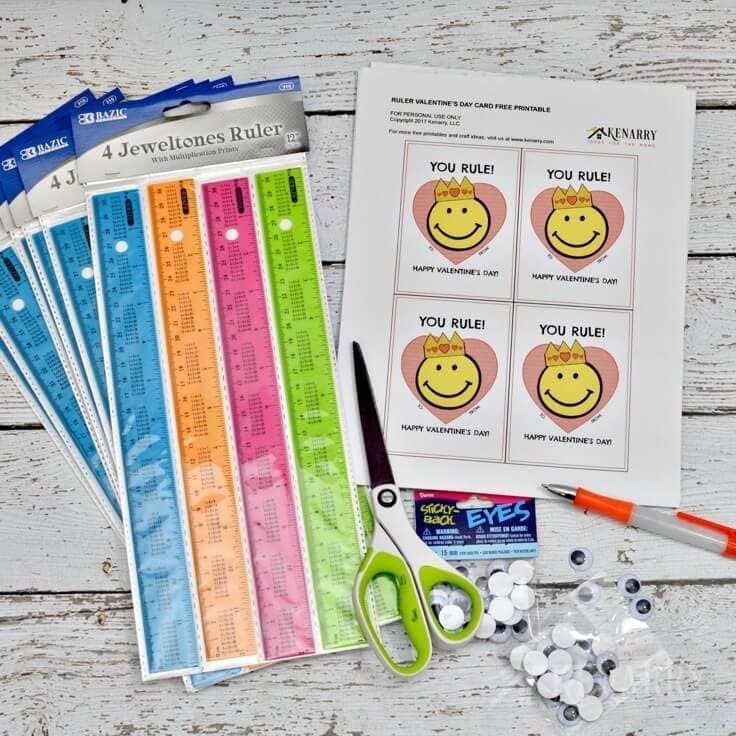 Today, we’ll show you how to make Ruler Valentines with a happy face emoticon and googly eyes. These free printable Valentine’s Day cards can stand alone as is or attach them to rulers as a school treat for your child’s classroom party. For my oldest son’s valentines each year, we like to create one of a kind cards or tags that could be attached to an inexpensive treat or trinket like stickers, pencils, candy or crackers. For preschool a few years ago, we created cute Fish Valentines that attached to a bag of goldfish crackers for my son to give his friends. Last year for his kindergarten class, we were struggling to come up with a creative idea. We wandered up and down the aisles at our favorite dollar store. Inspiration finally struck when we spied a pack of inexpensive, colorful rulers in the office supply section! We created a little design and message that was gender neutral so it could work for boys or girls. Emoticons and happy faces are super popular right now so we found a way to incorporate those into our valentines too. Then we cranked up the silly factor by adding googly eyes to make the faces extra fun. We thought your preschool or elementary child might love these silly cards too so we’ve made the Ruler Valentine Cards available as a FREE digital download exclusively for Kenarry Idea Insiders. 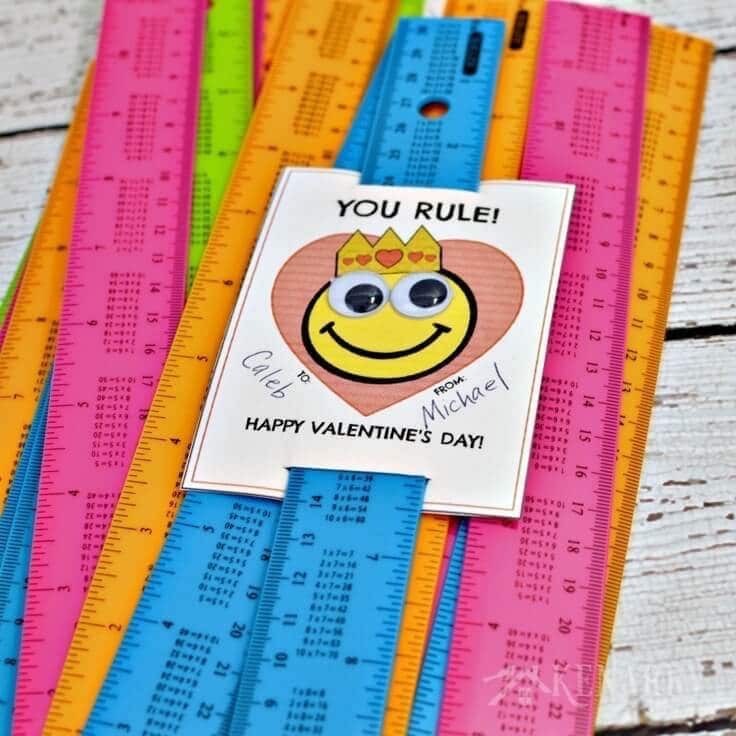 You don’t need much to make these cute Ruler Valentines. 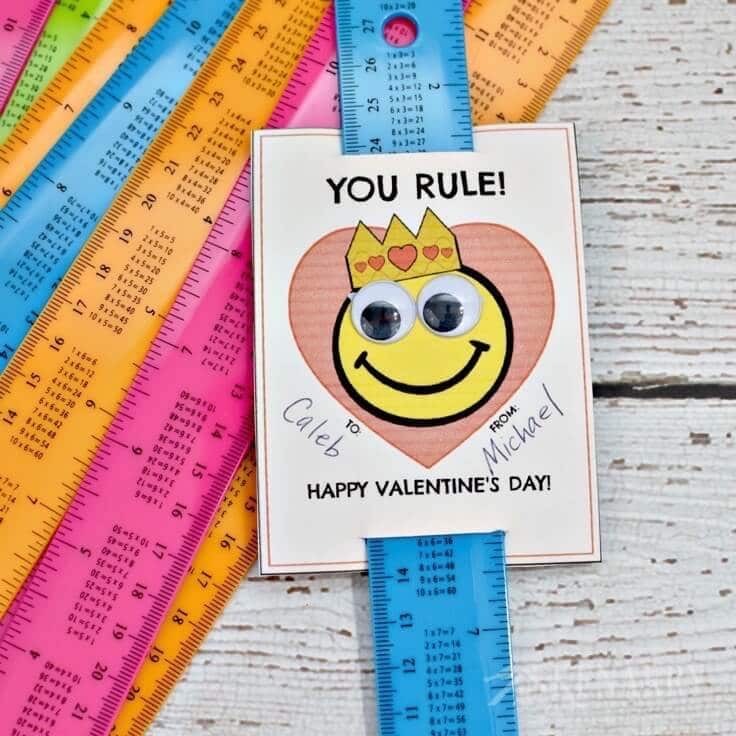 All you need are inexpensive rulers and our free printable Ruler Valentines for a valentine card your child’s friends will love. You can attach self stick googly eyes too if you want to make yours as silly as ours! 1. Get the Ruler Valentine Cards. The printable Ruler Valentines are available as a FREE gift when you sign up below! Then you just need to download the PDF file and save it to your computer. The Ruler Valentines and all other free printables from Ideas for the Home by Kenarry™ are for your own PERSONAL USE ONLY. Once you have the file, print the tags for the Ruler Valentines on white card stock. 2. Cut and sign the Ruler Valentines. Cut the Ruler Valentines apart. For straight lines, I’d suggest using a paper trimmer, but you can always use good ol’ fashioned scissors. If your child is able to write, have your child put his or her name on the Ruler Valentines. The last few years, we’ve found my son’s teachers prefer that the students do not address cards to specific kids. Check with your child’s teacher to see how he or she wants to do it. Some find that the whole distribution process at the Valentine’s Day party goes much faster without names on the valentine cards. Since the preschool or kindergarten students can’t read, they can just hand the valentine card to any kid. 3. Cut a slit in the Valentine cards. Next, use an X-acto knife to cut a small slit at the top and bottom of the Ruler Valentines. You want the slit to be just slightly larger than the width of the ruler. Our rulers had holes through them so as an alternative you could use a hole punch and ribbon to attach the cards to the rulers if you prefer. 4. Attach the cards to rulers. Slide the rulers through the slits you made at the top and bottom of the Ruler Valentines. At this point the cards are pretty cute, so you can skip the remaining steps if you want to leave the free printable Valentine’s Day cards as is. 5. Stick googly eyes on the happy face emoticons. If the googly eyes you bought are self-adhesive you can peel the backs of the eyes to stick them to the Ruler Valentines. If not, just use a small dab of school glue. This is a great step to have your child help you. 6. Finish the remaining Ruler Valentines. 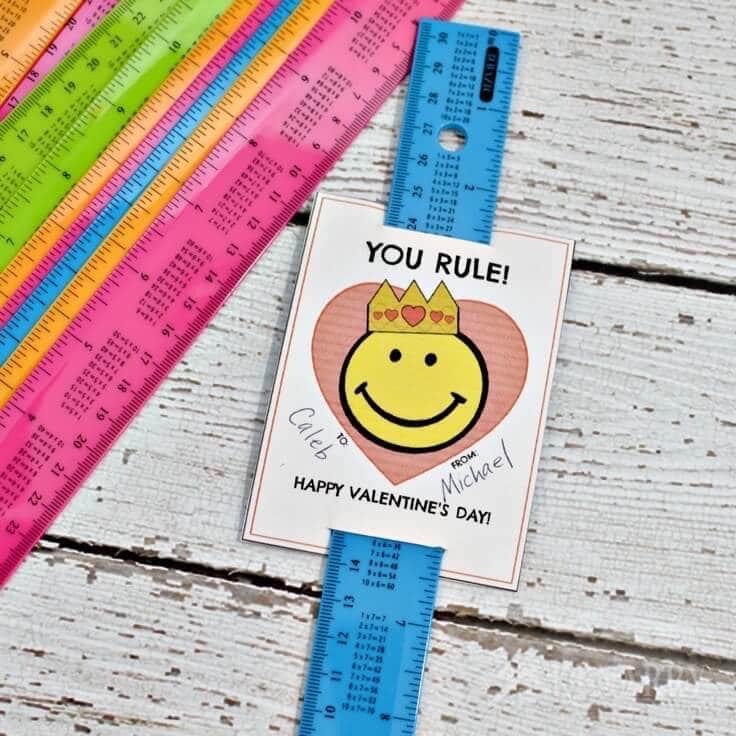 Repeat these steps until you’ve made as many Ruler Valentines as you need for your child’s classmates. We liked using the colorful, fun fluorescent rulers we found at our local dollar store, but you could easily use regular 12″ wood rulers. 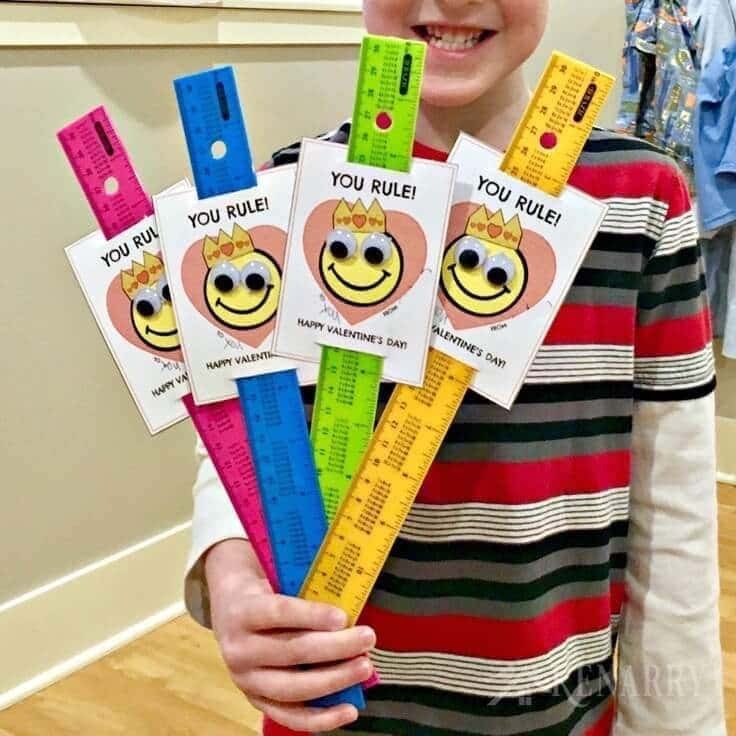 Our son was so excited to help make these Ruler Valentines and couldn’t wait to give these cards to his classmates at school. His biggest challenge was deciding which friend would get which color! We hope you enjoy this colorful and fun treat for your child to give as valentines at school! 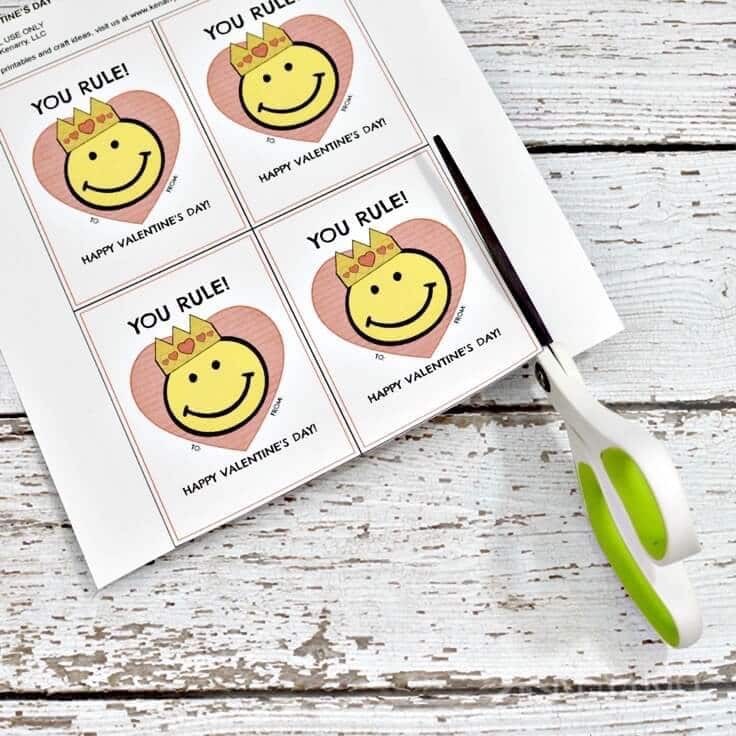 You could also cut the “Happy Valentine’s Day” part off the bottom of the cards and just use the free printable tags on a ruler as a birthday party favor. It would be great for a prince or princess themed birthday party or for a child who loves happy faces or emoticons. What kind of valentines does your child give at school? Have you seen any really creative ones? Please comment below and share. We’re always looking for new ideas. Fun idea! The printables are great. Thanks for sharing at Snickerdoodle. Pinning to my Valentine’s Board. Glad you liked it enough to pin it to your Valentine board! Thanks Beverly! Thanks, Melissa! 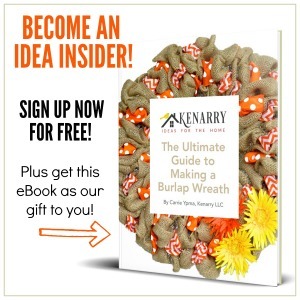 These are definitely inexpensive and easy to make! Thank you Angie! We’re glad you liked them. Visiting via the Sew can do linkup! What a fun Valentine! Thanks for sharing at the Inspiration Spotlight party. Pinned & Shared. You are the best, Theresa! 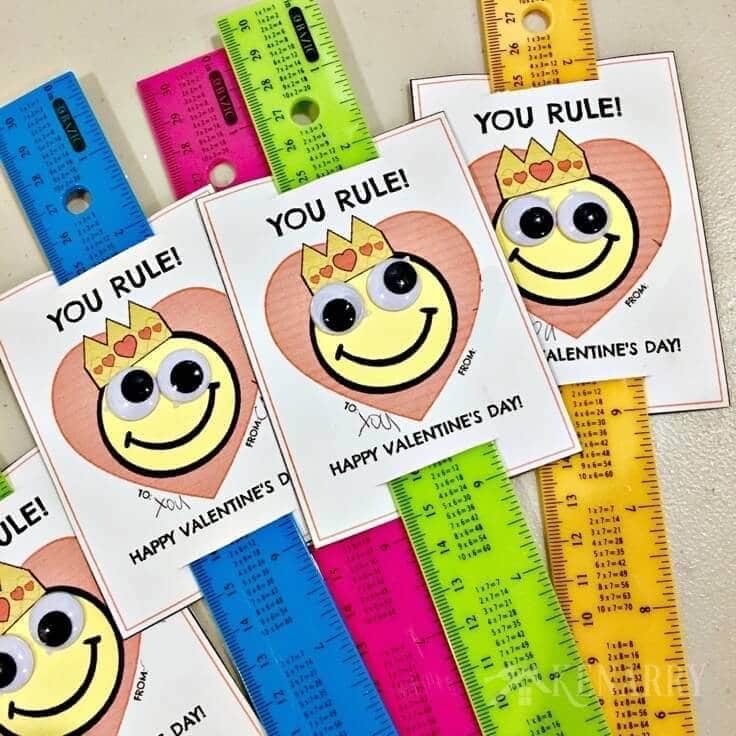 Thank you so much for pinning and sharing our Ruler Valentines. Such a fun idea. Thank you for linking with us at #HomeMattersParty . We would love to see you again next week. Thank you for hosting, Sahana! So glad you stopped by! This is a great idea and affordable too!Thank you for sharing this with us @FuntasticFriday!